You guys are probably so sick of seeing me wear these boots! I have really gotten my money's worth out of these. I wear them so much because they go with everything and they are so comfortable. Don't mind my hair here. It was so windy, there was no hope for it so it looks like a mess! Looking beautiful, as always! I like your chunky cardigan very much! Obsessed with those boots! Love the detailing in the back. Cozy cardigan, love it because it's so much Christmas over it! I love, love. love this outfit! Oversized everything has been my uniform this fall, but cardigans are at the top of my list for sure. This one is so festive in it's color as well! I love the oversized cardigan! This looks fantastic on you with the boots. 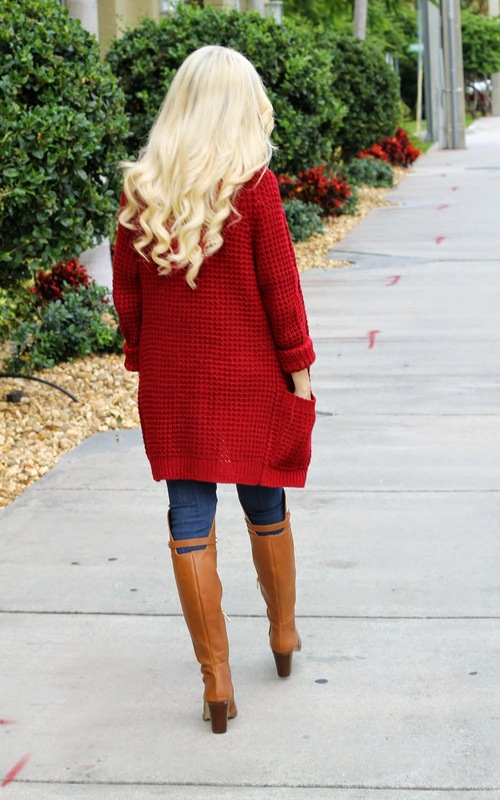 Love this cozy red cardigan and I'll never get sick of these boots! Any baby updates? I can't ever get tired of seeing those boots! Wish they still have them available in tan, but I'll wait, maybe in January? I love that necklace! It is super cute and perfect for the holidays! Also, your hair looks gorgeous!! Beautiful as always! Love that cardigan!